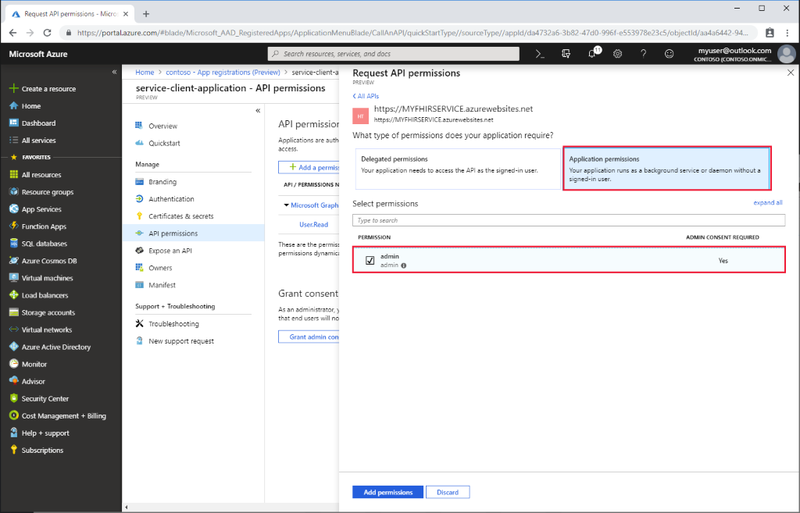 In this article, you'll learn how to register a service client application in Azure Active Directory. Client application registrations are Azure Active Directory representations of applications that can be used to authenticate and obtain tokens. A service client is intended to be used by an application to obtain an access token without interactive authentication of a user. It will have certain application permissions and use an application secret (password) when obtaining access tokens. Follow the steps below to create a new service client. In the Azure portal, on the left navigation panel, click Azure Active Directory. The service client needs a display name and you can also provide a reply URL but it will typically not be used. You will need to grant the service client application roles. The service client needs a secret (password), which you will used when obtaining tokens. Provide a duration of the secret. Once it has been generated, it will only be displayed once in the portal. Make a note of it and store in a securely. In this article, you've learned how to register a service client application in Azure Active Directory. Next, deploy a FHIR API in Azure.